PhpStorm 2018.2 is now released! PhpStorm 2018.2, the second major update for PhpStorm in 2018, is now available! You can download it here or via JetBrains Toolbox App. Our website has all the details of this release, and here’s a roundup of the notable highlights. Please see our issue tracker for the full list of fixed PHP-related issues, and release notes from all previous EAP builds. watchers, rerunning failed tests, and much more. IntelliJ Platform has provided this release with lots of new features as well as bug-fixes. Specifically, updated UI with brand new icons, dark title bars on macOS, and TouchBar support for MacBooks, as well as improved VCS support with new ways to resolve merge conflicts, enhancements in VCS Log, support for multiple GitHub accounts, and even more. Database tools have been improved with the new SQL formatter, source code migration, query plan diagram, custom data sources and more. For more details please see What’s New in PhpStorm 2018.2 and download a free 30-day PhpStorm trial for your operating system. PhpStorm 2018.2 is available as a free update for everyone who has an active subscription for PhpStorm or All Products! This entry was posted in Newsletter, Release Announcements and tagged 2018.2. Bookmark the permalink. For more details please see What’s New in PhpStorm 2018.1 and download a free 30-day PhpStorm trial for your operating system. For more details please see What’s New in PhpStorm 2018. *2* and download a free 30-day PhpStorm trial for your operating system. Sure, fixed! Thank you for noticing and reporting! Where is my snap package update? This is already becoming a tradition: in addition to all the cool things to add a couple of usability regressions. Thanks for bringing this up. New one is hardly a regression – that’s a simple cosmetic change, which was positively received by users (but not all, yeah). Next one was just fixed and planned for a next major update. Others are indeed little bit on halt: there are no updates since 2016 & May 2017. Probably it’s time to leave few comments checking for any updates/estimates. PhpStorm 2018.2 snap still isn’t available in the Ubuntu Software store; please update the snap to the latest version. default.” but PHPStrom still warns “ex-json is missing in composer.json” which is wrong. https://youtrack.jetbrains.com/issue/WI-42997 is filed to cover this case. Thank you for reporting the problem! The TouchBar config seems to be missing? It was in the keymap section in the EAP. No similar reports so far. Please move the .idea folder out of the new-client-2 project, start PhpStorm 2018.2 and check if it starts OK this time. If it doesn’t, please rename the %USERPROFILE%.PhpStorm2018.2 folder, start 2018.2 once again not importing settings and check again. 2018.2 seems very buggy on Mac OS. PHPStorm is constantly indexing and shelving and committing changes locks up my computer until PHPStorm eventually just crashes. The interface enhancements look nice but not worth the issues that it introduces. I hope JetBrains has an incremental release soon. Those enhancements probably have no relation to the issue you are seeing. I’m using new phpstorm at the latest mac os (high sierra). Everything works well. But some time ago i faced with same indexing problem because of buggy lua plugin (emmy lua or something like that). Check your plugins. Try to toggle them off. 2018.2 is very buggy to me (Windows 10). I would suggest installing 2018.2 again & then contacting our support team to inspect those issues closely. Looking to update phpstorm 2018.2..! In debugging via SSH-tonnel with xDebug, PHPStorm not highlight catch like before. Program Icon of the project which catch xDebug signal on windows task bar not blinking like before. Just nothing happend. It is unuseful case. Nothing changed on that matter. Was PhpStorm added into firewall exceptions after the update? 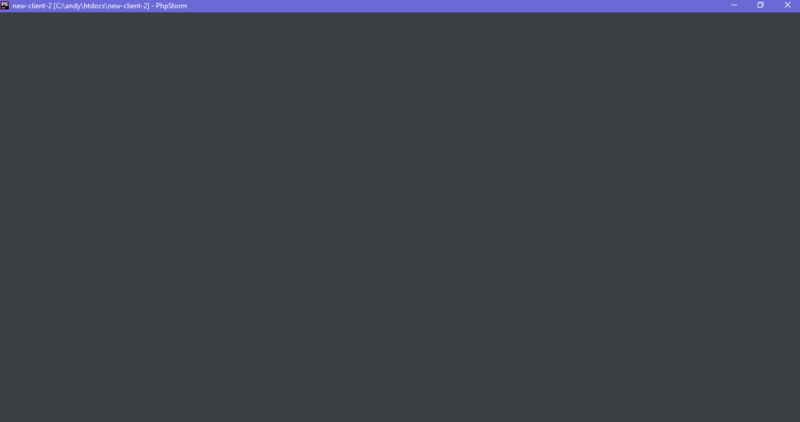 Are you able to connect to PhpStorm’s port through the tunnel? All debugging processes working correct. I don’t know: catch PHPStorm signal or not and should check every time. When editing a certain css file (not other css files), it shows me the “before” state in the editor so it looks like the changes were never made and have been lost. Looking at the file with another editor reveals, that the changes have indeed been made, but for what reason whatsoever, the PHPStorm editor reverts to the previous state of the document after hitting save. Also tried clearing the system cache and whatnot – to no avail. Somehow PHPStorm just doesn’t like that specific CSS file very much. This is an absolute showstopper, and I had to use sublime text again and a separate FTP client and GIT client to get things done in time. The issue went away after we’ve started to investigate it in details. The cause was a state of a file watcher checkbox that wasn’t saved between PhpStorm restarts. Unfortunately we weren’t able to track down the very root cause of it.